The UVS100 Custom Sunscreen is the only windshield sunscreen to earn a U.S. Patent. The UVS100 custom windshield shade is made by hand, one unit at a time, from laminating the panels to cutting the pattern. These are truly Crafted2Fit®. Currently, please expect 2-3 weeks for your order to ship. Show your support for Breast Cancer Awareness with "Covers for Causes". Covercraft contributes a percentage of sales profits from these products to breast cancer research programs. The pink UVS100 proudly displays the Covercraft "Covers for Causes" pink silk-screened logo. 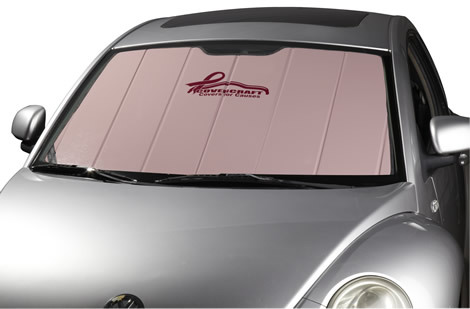 Purchase this windshield shade as a way to show your support for breast cancer awareness and research.